If you have had a virtual tour made and would like to add it to your IDX Profile Page, then follow the steps below. Some MLS’s offer unbranded tours and we can allow these tours to be shown automatically on your site. To see if that feature is available for your area, please contact us. Take a moment to read our special note at the bottom of this page regarding the automatic linking to these tours. 2. Once logged in, from the main navigation bar select Listings > Add Virtual Tour / Add External Link. 3. Enter the MLS number of the listing you would like to enhance and click Submit. 4. Verify you have the correct property. 5. Paste in the link to your tour. This should be provided to you from the company that set up your virtual tour. Feel free to use the branded tour since this is going to show on your IDX listing pages. 6. Select whether you would like the tour to open in the existing window or a new window. We would suggest having the tour open in a new window. This way if the visitor closes the tour, they don’t lose your website. 7. Choose the label which will be displayed for your above link. You would normally just choose Virtual Tour, but if the link is to send visitors to another website or page about your property and include more than just a tour, we have included the generic term ‘Enhanced Information’ for you to select. 8. When you have completed the above steps, choose Submit to add your tour. 9. You can view your new link to ensure it is working correctly by clicking the View icon to the right of your listing. The view icon will take you to your IDX page where you can see the new link just under the listing’s thumbnail images as shown below. Special Note: IDXCentral.com does not show virtual tours from the MLS by default. This is to protect the agent / broker’s website. 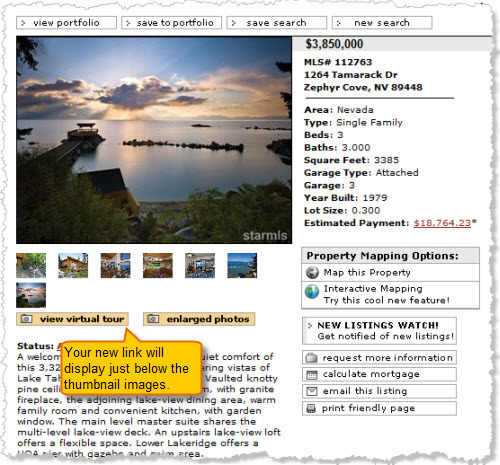 We can not control what content is put in a virtual tour, therefore we owe it to our clients to block it from being displayed. If we were to show a tour that a Coldwell Banker agent entered into the MLS on a Keller Williams agent’s website, the Keller Williams agent would not like it if the tour was advertising the Coldwell Banker agent. Some MLS Boards / Associations are better than others about policing the ‘unbranded’ tours, but we leave that decision up to our clients as to whether they wish to display the tours of other agents. 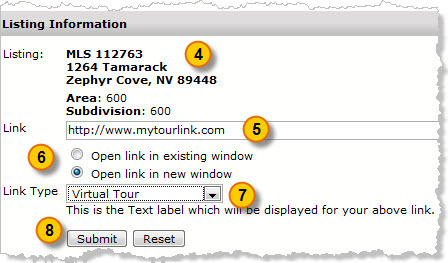 If your MLS does pass us the tour and you trust your fellow agents to not place branded tours in the system, please contact us and we can determine if this feature can be enabled for your area to show all tours automatically.